General Information. Need some help cutting through the jargon? Not sure which product is right for your application? 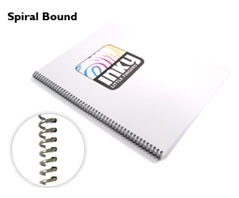 This page explains the different kinds of binding that we offer, the features of each one, and their most common uses. ideal for; manuals, books of sheet music, cookery books etc. coils are available in a 45 different colours, including metallic, neon colours and even glow in the dark (many colours must be specially ordered). Usually known as booklets and used commonly for brochures. 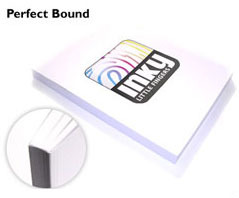 appearance varies according to the finish selected; standard self covered brochures are used by the millions for advertising and at the other end of the spectrum brochures with heavy laminated covers and quality inner paper are used for very high quality reports and product brochures. 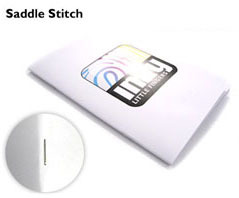 can be used for between 2-25 sheets (80gsm paper); equivalent to 100 pages. these are the same thing as "softback" books. contents cannot be altered (i.e. the binding cannot be opened & re-closed). 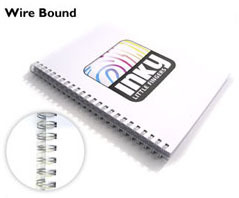 can be used for between 10-400 sheets (80gsm paper); equivalent to 800 pages. 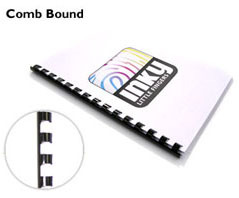 ideal for; softback books, yearbooks, annual reports, catalogues and brochures. cost effective for short to very high quantities.